Welcome to MLB: The Defunct Series! After spending last year producing Project 32’s myriad of redesigns and tweaks, I figured that I should apply the same philosophy to the defunct teams of the majors. Much like its predecessor, each team will have two to three parts. The first part will be the main concept, the one that I’m happiest with presenting/matches the historical trajectory of the team’s aesthetics. The other will be an alternate take, in which I can explore different identities and shirk brand equity to have a little fun. I’ve also got plans to include several attempted relocations, with a focus on deals that fell through at the last minute/pose the most visual interest. These will not have alternate takes since they are essentially alternate takes in their own right. The releases will go by chronology, starting with the Boston Braves. The only one out of order is the last one since the short lifespan of the said team leaves their visual history up for more speculation. Despite a World Series win in 1914, an additional NL pennant in 1948, and several pre-World Series pennants, the team was constantly losing money, losing games (5118-5598, .478 winning percentage), and drawing poorly. With it becoming clear that the team couldn’t stick it out in Boston, they moved to Milwaukee and kickstarted a large wave of relocations. However, what if things had worked out differently? What if the Braves managed to gain stable, wealthy ownership while in Boston? What if they were able to coexist with the Red Sox, or even drive them out eventually (Yawkey probably wouldn’t have gone for it)? Well, let’s see the modern Boston Braves! The uniforms are my standard Braves concept with key adjustments. 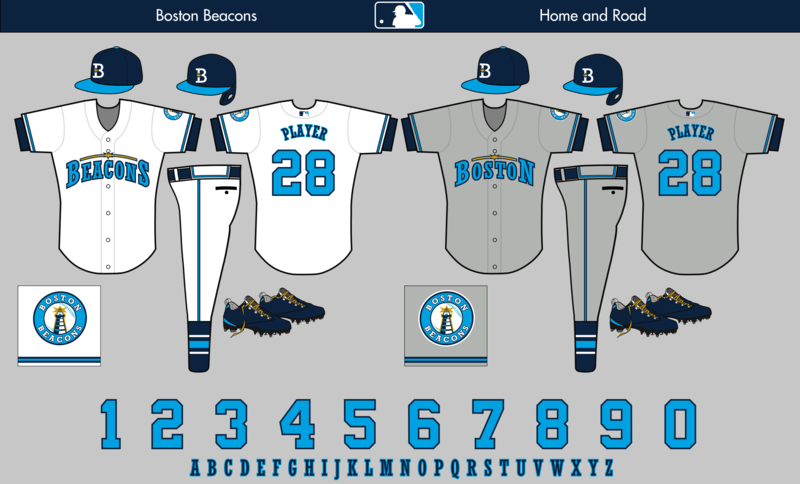 The road uniform uses the “Boston” script and the caps feature the new “B,” while arched NOB’s give way to an arc. I figured minor differences like that would pop up. 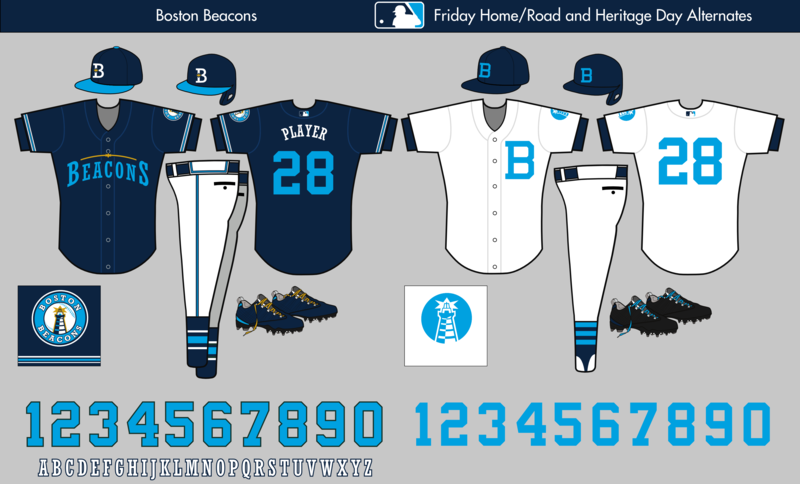 The navy alternate is pretty much the same as my previous Braves redesign, while the home alternate is a new construction. 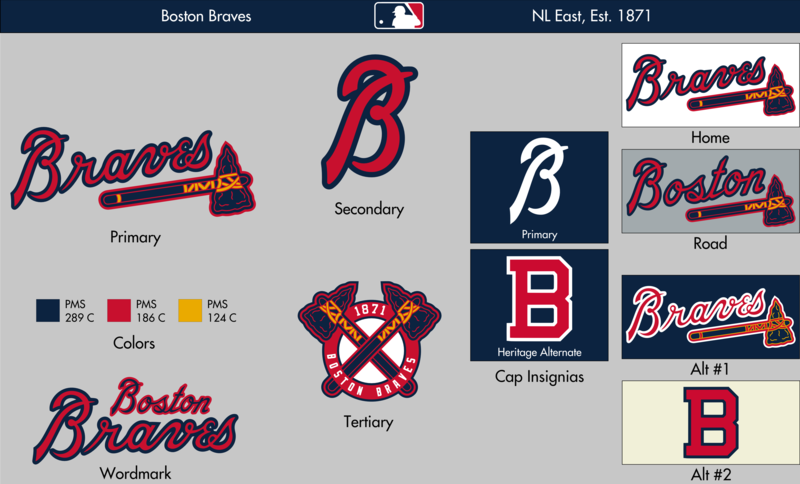 I used the 1914 Braves’ “Block B” on the cap and jersey, to tribute both the 1914 “Miracle” Braves and the years in which the team wore a “B” on their home jersey (1907-09, 1913-15, 1921-26, 1937-38, 1940-44). It’s my way of honoring the pre-1946 identities. The dugout jacket is much the same as the Atlanta equivalent, albeit with the new patch. C+C is appreciated, as always! Up next, what if the Boston Bees hadn’t returned to the Braves name, but debuted a new moniker? As far as attempted relocations, don't forget the Padres and Astros almost moved to DC in different decades. Astros tried maybe two or three times to leave Houston before Minute Maid Park was built. Oh, you're kidding me, another series!? STOP BEING SO AWESOME!!! Braves look smart of course, although on your tamer side, not a pixel out of place as always. Wicked hyped for this, my friend. Love the tertiary and the fauxback. Look forward to this series. Damn, you weren't lying... there's a LOT of Milwaukee here! And is that a Milwaukee White Sox concept I see in the wings? Apart from the St. Louis Browns actually moving back to Milwaukee as Bill Veeck wanted, that's one alt history scenario I really wish could have happened. Wow, this project ended up being bigger and better than I could have ever imagined! The Boston Braves of course look great, but I'm most looking forward to the alternate takes. Can't wait to see the Bees! The relocation part of the project intrigues me greatly, too. I see you're planning to take on the Tampa Bay White Sox. Might I suggest going with a hunter green and orange color scheme? This should be fun! I love MLB history off the field with potential relocation and movement in the discussion. Looks like you came up with some great ideas! Looking forward to this. Boston looks good. There is an issue with the heritage alt helmet. The “B” seems to be missing an outline. Other than that simple fix, looks great. Love the away uniform. Love your concepts because I know you will pump out many without sacrificing quality. Good stuff! That “Boston” script is a beauty. I’m beyond excited for this series! It seems like there are a lot of cool ideas in here, and I can’t wait to see you knock them out of the park. Don't forget that the Twins almost moved to Greensboro, of all places in the '90s. Can't wait to see this series play out, especially considering how amazing Project 32 was! Wow, I'm amazed at how well the B from the script works as a cap logo. Great job on the uniforms, I love the navy tomahawks. Thanks, guys! I'm looking forward to putting this series forward to all of you. Thanks! Good catch, I've fixed it in the post. Thanks, guys! This was just an initial list of relocations. I plan to add more as the series goes forward. I've got a few fun ideas for how the make Twins' identity work in the Carolinas. Thanks! Yes, I could almost call this series Milwaukee Madness! You'll definitely see the Milwaukee White Sox and the Brewers (former Browns) in this series. It'll be a bit of a challenge to make the different concepts look seperate from each other, but I think I can manage. Thanks! I too was surprised by how its scope grew in the planning stage. While you won't be getting the Bees, I'm hoping you'll like what I've cooked up here. That color scheme for the Tampa Bay White Sox is a good idea, as I assume they wouldn't have had the "we've finally found our identity" moment they had in 1990. It's also easy to work white into that design, for obvious reasons. Anyway, it's time to shine a light! Instead of going back to the old name, the Boston NL syndicate looked out from Boston University’s campus PD headquarters/Nickerson Field to Boston harbor. While peering into the distance, they found inspiration in the various lighthouses of Boston and New England. They opted to adopt a new name, “Beacons.” It was a two-syllable name that had alliteration with Boston, and in proto-Nike speak, was a symbol of the franchise gaining a guiding light to success. Their design took inspiration from the uniforms worn by the 1929-35 teams, with a logo incorporated into text (which would be a modified Rockwell by the modern day). The team also chose to make Columbia Blue the prominent secondary color (alongside the Bees’ gold color), as it reminded the syndicate of their days on the beach. The uniforms take inspiration from the 1929-35 and 46-52 Braves, using a co-dominance of Navy and Columbia with gold accents. 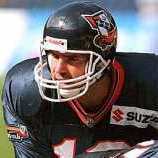 The primary logo occupies the sleeves, while the wordmarks feature the “beacon” above arched text. The cap logo incorporates the beacon into the letter “B.” It may be a bit Rays-ish, but I’d like to think it’s a bit better executed. Rockwell NoB’s appear here, alongside Wilson Varsity numerals. The home/road alternate is a navy version of the home uniform, with no white outlines, as they’d clutter the design. 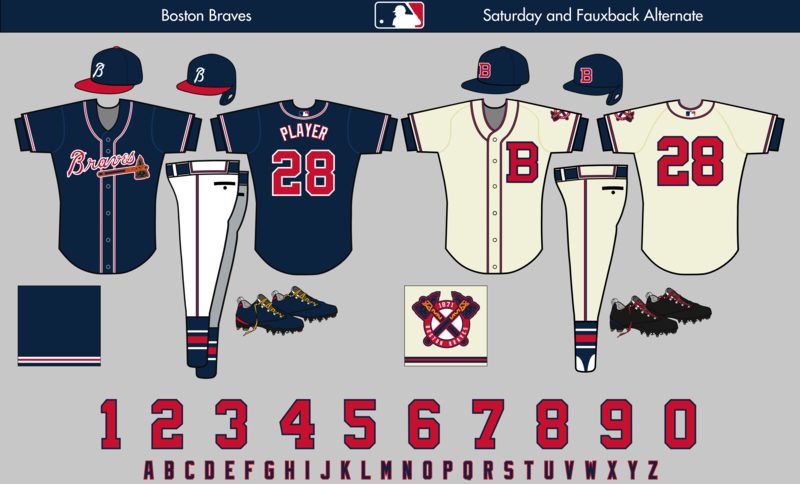 The fauxback alternate is a “Beacon-ized” version of the 1914 Braves’ home uniform, complete with a color-appropriate patch. I added the “block B” to the cap, for an extra flourish. 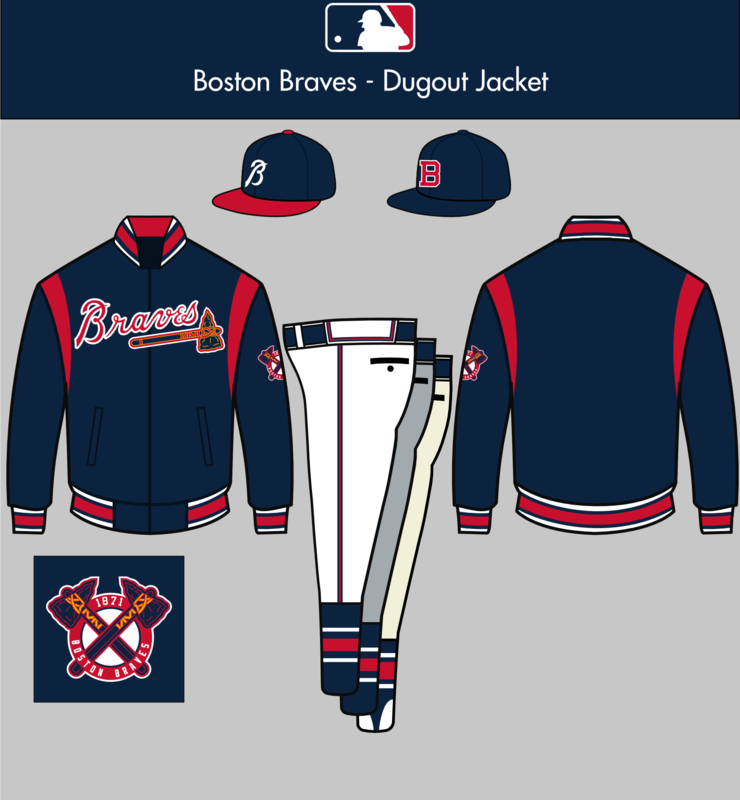 The jacket has a similar design to my Braves jacket, albeit with gold shoulder inserts, the “Boston” wordmark, and the tertiary logo on the back with an “Est. 1871” wordmark. This connects them to the long lineage of the club, predating the National League. Also, I’ve got to give a shoutout to @pcgd and his Beacon Hill of the America League series for inspiring this concept. If you want to read about the Boston Braves’ history, here is an excellent SABR article. C+C is appreciated, as always! 1LeMoine, Bob. “Boston Braves Team Ownership History.” SABR. Accessed June 8, 2018. https://sabr.org/research/boston-braves-team-ownership-history. 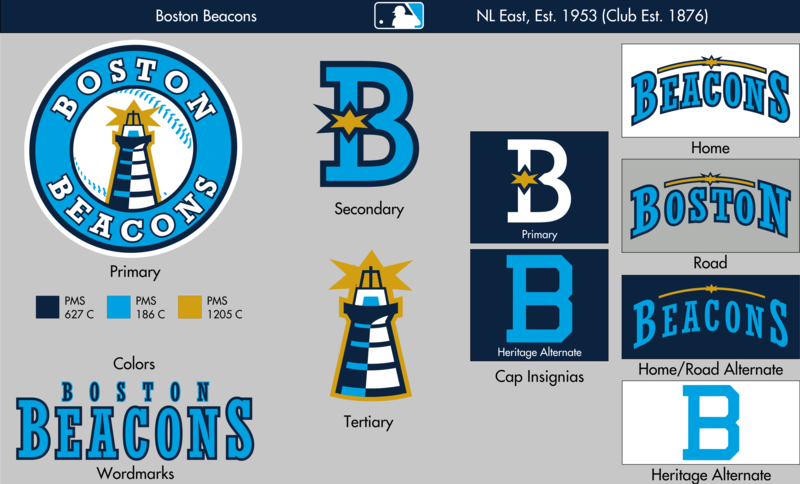 That Beacons concept is everything the Rays should be doing with those colors. Nice work! Great name, great color scheme, great logo. Very creative! Oh, this is good. This is gooooood. The Beacons look fantastic; loving the primary logo. Wow is that pretty... Especially the navy alt. While I would’ve loved to see you try and do the Bees, this is a clean looking set with a one of my favorite color schemes. Great job! Make this a real team someone, anyone. Great colors, great logo, great information and uniforms. Just one suggestion for you, did you try to put the light inside the top part of the B for the primary cap logo? I like the concept. Very similar to UMass Boston.